What is the 50@50 Monthly Donor Program? There are many good reasons to become a Kybele Monthly Donor. Supporting Kybele through monthly donations spreads your generosity throughout the entire year. Small non profits often encounter uncertainty as to when and how large or small donations might be. This can limit the organization’s operations. A predictable funding stream would enable Kybele to be even more efficient in managing resources effectively. As our programs grow, so must our resources. 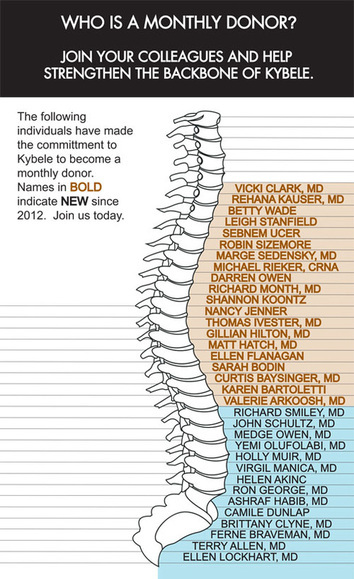 Help support the backbone of Kybele. Our goal for 2012 is to have at least 50 new monthly donors giving at least $50 per month for a minimum of one year. Help support the backbone of Kybele. We are depending on you. UPDATE: YOU CAN STILL TAKE PART IN OUR 50@50 CAMPAIGN IN 2013 AND 2014. CLICK HERE TO SIGN UP.